This Template ready for use Industries, School, Shop and any business. The template comes with a host of features leaving you with almost endless possibilities when laying out your content including multiple layout options. 70+ module positions with total width control, easy edit logo and use Google fonts in all within a Fully Responsive Design that adapts screen size. You can discover many new awesome features in this template. • Designed with HTML5 and CSS3/.less. 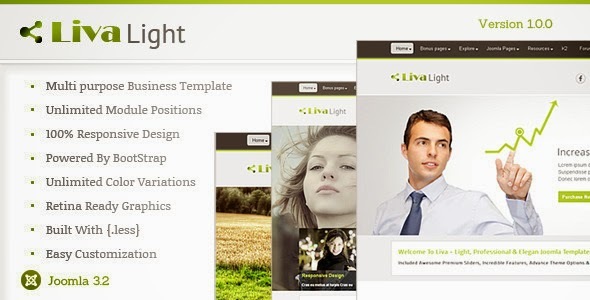 Item Reviewed: Livalight Theme - Responsive Multipurpose Joomla 9 out of 10 based on 10 ratings. 9 user reviews.